More than once on this fantastic tour made possible by The Council of Europe and The European Institute of Cultural Routes, I caught myself agape at yet another moment of “I’ve always dreamed of doing/experiencing this! !” And our evening abode at the end of the jam-packed day of adventure on 22 May was the instigator of one of those very moments. 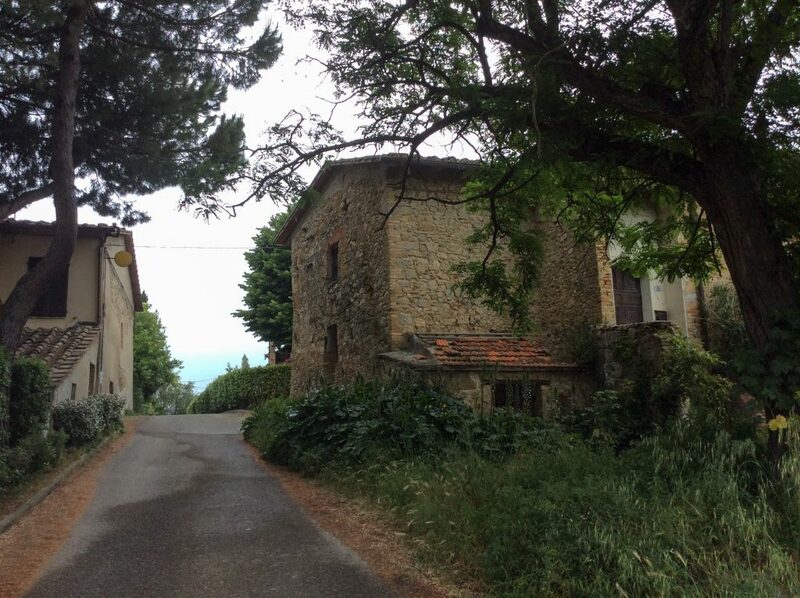 Our team, feeling grotto-style relaxed coupled with a good dose of road weary fatigue, was carried by comfortable Mercedes van down a winding Tuscan country road just a few kilometers from San Gimignano. The small grouping of obviously ancient buildings that appeared just ahead immediately caught my eye…were we staying here tonight? We were, and I was thrilled. 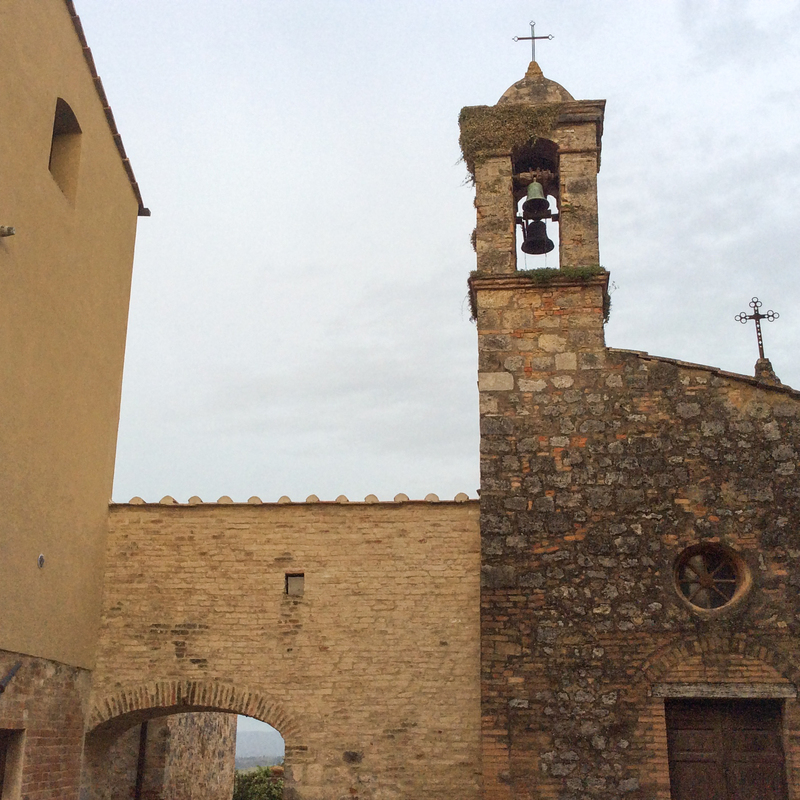 Called Antico Borgo de’ Frati, or Ancient Village of the Brothers, this small grouping of buildings and surrounding farm land were donated some 650 years ago to the Friars of St. Augustine. Very recently fully restored and opened for holiday rentals, this little borgo has found new life through the loving hands of its owners. 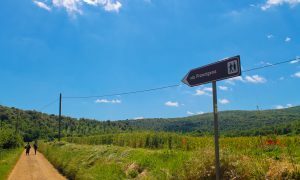 The historic Via Francigena route (see earlier post for a little background there) is situated a mere 2 km away as it runs towards San Gimignano, and it’s certain that the friars here hosted many a weary pilgrim on their spiritual way. I stole a quiet walk while the others were freshening up; the ghosts of history were almost tangible — hard working farmers and their families, introspective friars, travelers seeking rest, ordinary folks throughout the ages whose feet, hearts, and minds had trod, slept, and lived in this very place that I was blessed to have a small part of. I pondered this as I rounded a corner of one of the small buildings. A nest of starling chicks overhead cried out in chorus as they begged for their mother’s return, and at the same time I could hear a baby’s cry from one of the small dwellings. 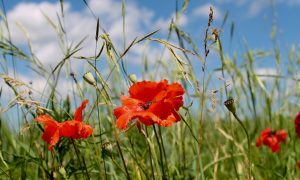 As ordinary a moment as that was, I was struck with a sense of awe at the common thread of life; how the cycle of life and living repeats in sweet ways over and over and over again in these humble hamlets of Italy’s countryside; and also of the hardship and pain and travails endured. Part of our stay included an amazing Tuscan feast at Trattoria Borgo di Racciano, just a stone’s throw away from Antico Borgo de’ Frati. Our table was filled with family-style Tuscan country fare such as various meat and cheese selections (pecorino to die for), tagliatelle con funghi, ribollita (“reboiled” soup), cinta senese (the indigenous black and white Tuscan pig) , roasted potatoes, and panna cotta (a creamy, custard like sweet) for dolce. 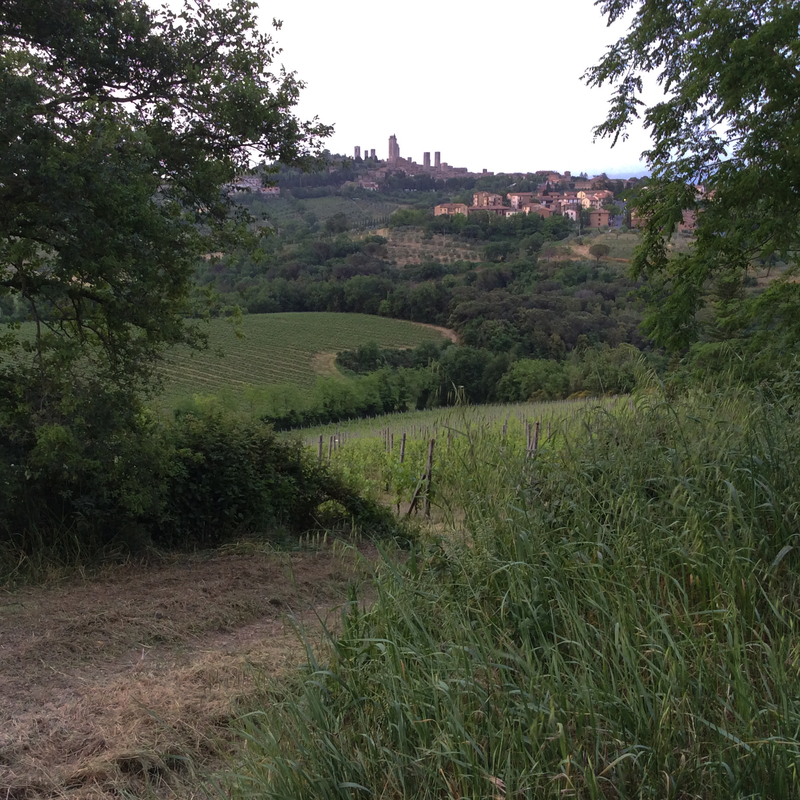 And wine…delicious, beautiful Tuscan wine. A lovely serenade of cool breeze, dancing fireflies, the crescent moon, and night bug songs accompanied this satisfied group back to our rooms. 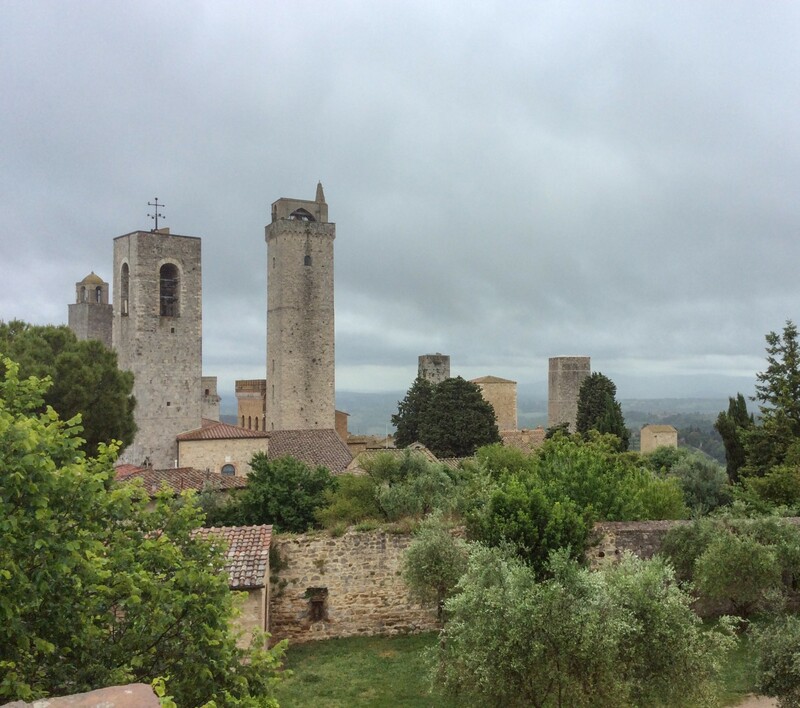 The iconic view of San Gimignano and her towers stood like a beacon on the morning horizon. 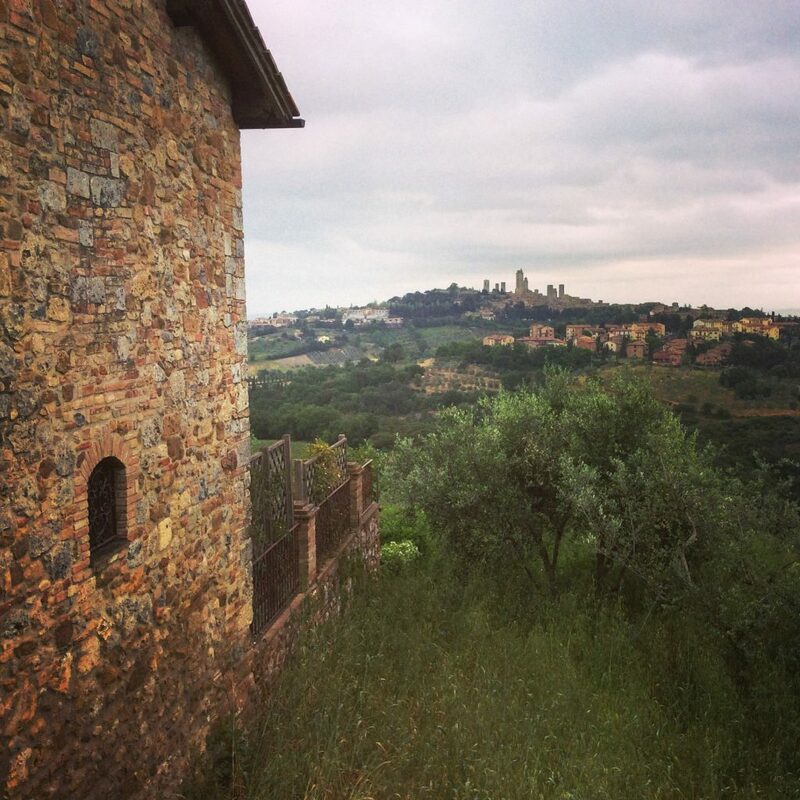 The panoramic vista over Tuscany and San Gimignano from Antico Borgo de’ Frati is stunning – it was hard to pull ourselves away. 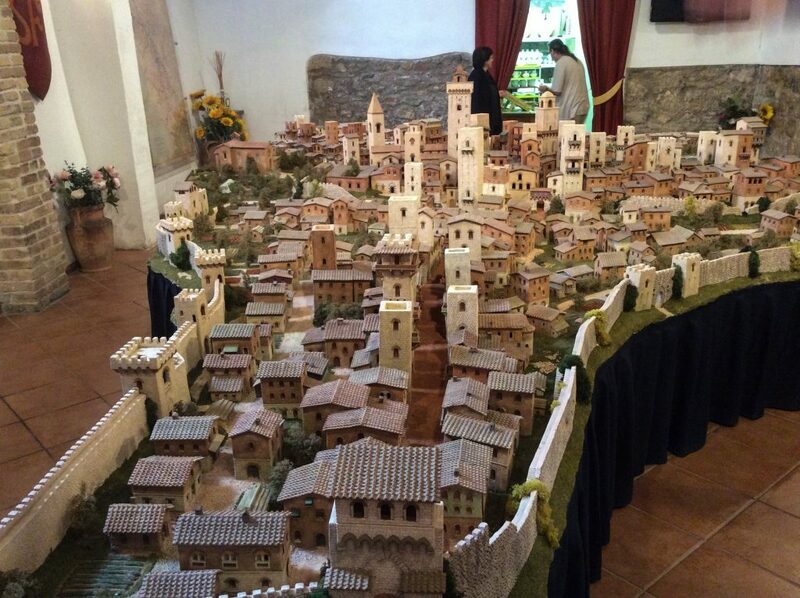 However, that lovely towered town awaited our visit, along with our upcoming bike trek along the Via Francigena. To the van…andiamo! 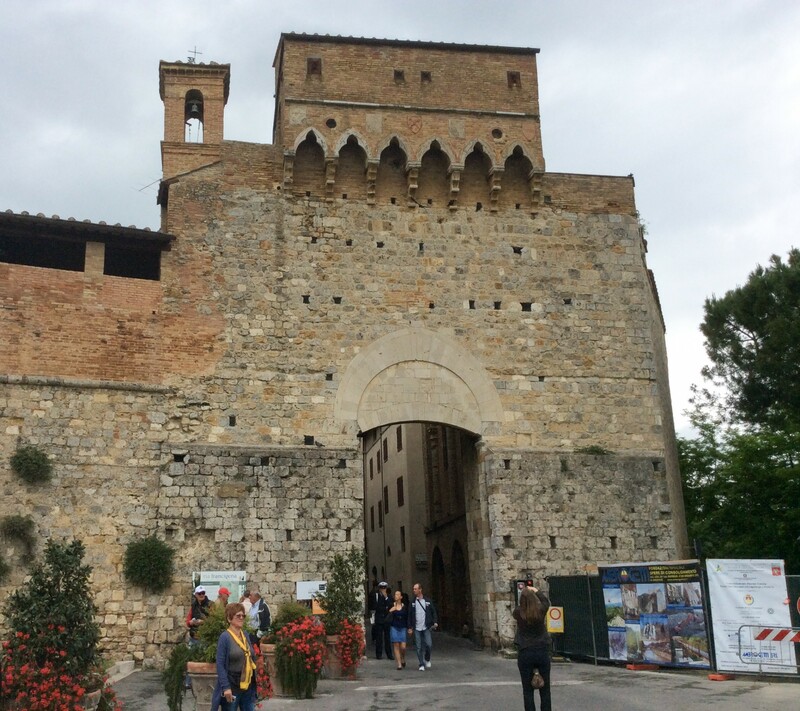 Fittingly so, our visit commenced through the main gate of San Gimignano — the same gate that welcomed untold pilgrims over the ages as they traversed the Via Francigena on their way to Rome. 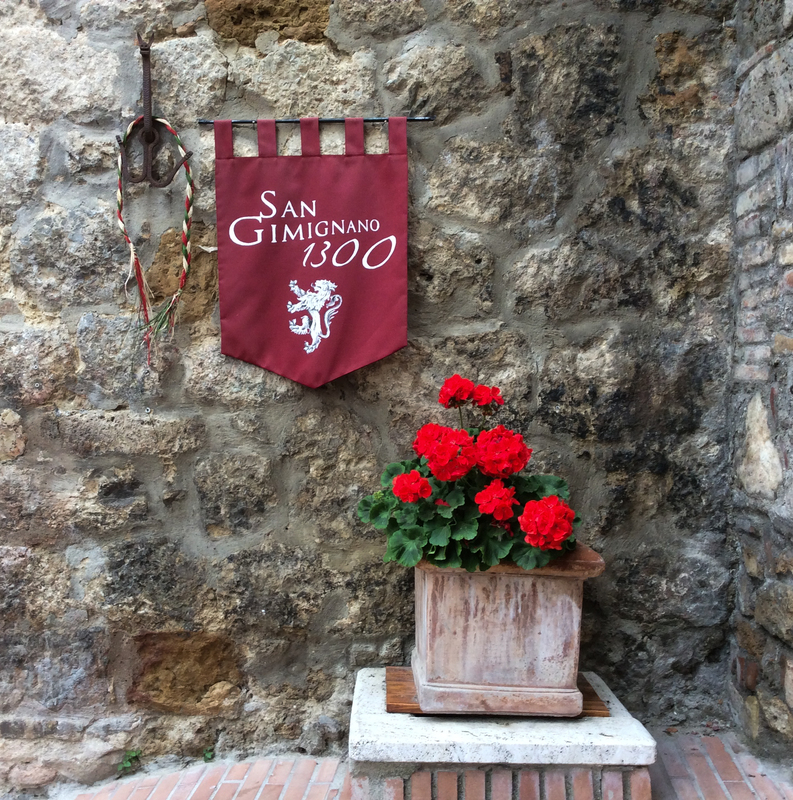 Thanks to this route , San Gimignano found a name for itself as far back as the late 900’s when the Archbishop of Canterbury made a pit stop here on his diaried pilgrimage. 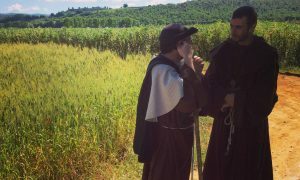 The Via Francigena was not only used by pilgrims, but also merchants, soldiers, and other travelers; thus, commerce thrived and steadily lined the pockets of San Gimignano’s entrepreneurs. Additionally, saffron grew in abundance here and was/still is a main cash crop, along with the hallowed Vernaccia wine (more on that delicious topic in a bit). As the rich got richer, the town’s persona also grew…upward. Known today for its unique skyline and sustained medieval charm, San Gimignano at one time boasted up to 70 towers…so the story goes. 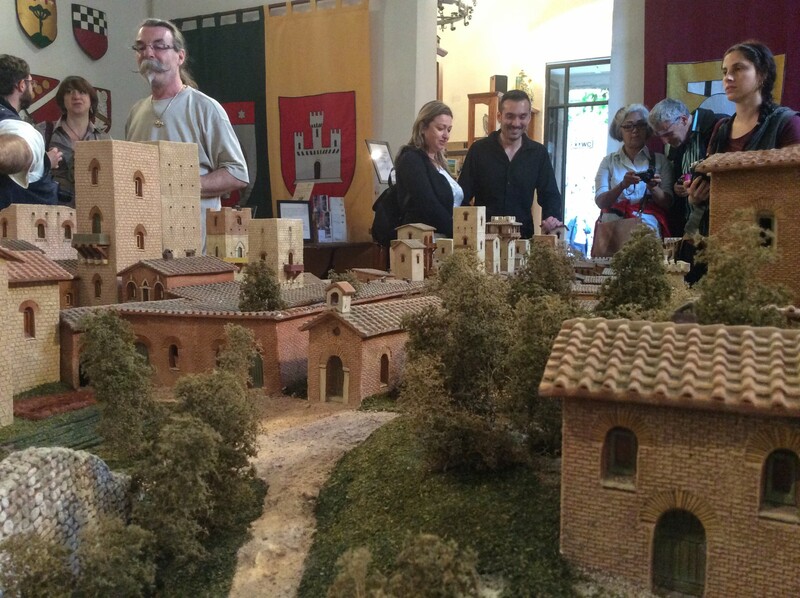 However, our wonderful guide, Claudia Margheri of TuscanyEx travel agency, shared that recent archeological research shows 45 – 50 towers were more likely the grand total. But who’s counting. Modern San Gimignano retains 17 intact towers, and it makes for an impressive sight, as well as a noticeably different feel compared to other Tuscan towns. As one wanders about, it’s easy to see why this charming town has the nickname “The New York of Italy”. Wanting to impress upon us the variety of visit-worthy sites, we were shown various shops of local artisans such as a weaver, ceramic artists, wood workers, and other impressive craftsmen/women. 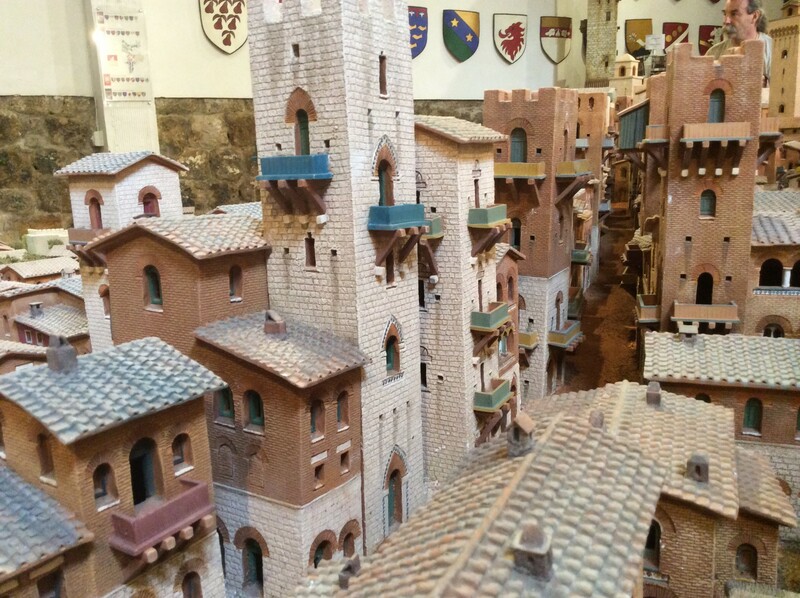 However, one “arts and craft” exhibit shone above them all… a very large, very accurate, 1:100 scale model of San Gimignano aptly titled San Gimignano 1300. The brain child/love child of two Master Artist brothers, Michelangelo and Raffaello Rubino, the project took 3 years of dedication and labor by a team of historians and artists to bring the 1300’s to life by way of a lot of clay. We were fortunate enough to meet Michelangelo and spend a little time asking questions and just admiring. The detail is fascinating and the exhibit is well worth seeing…free of charge, believe it or not. The brothers also display some of their other works, all strikingly beautiful, and offer them for sale. 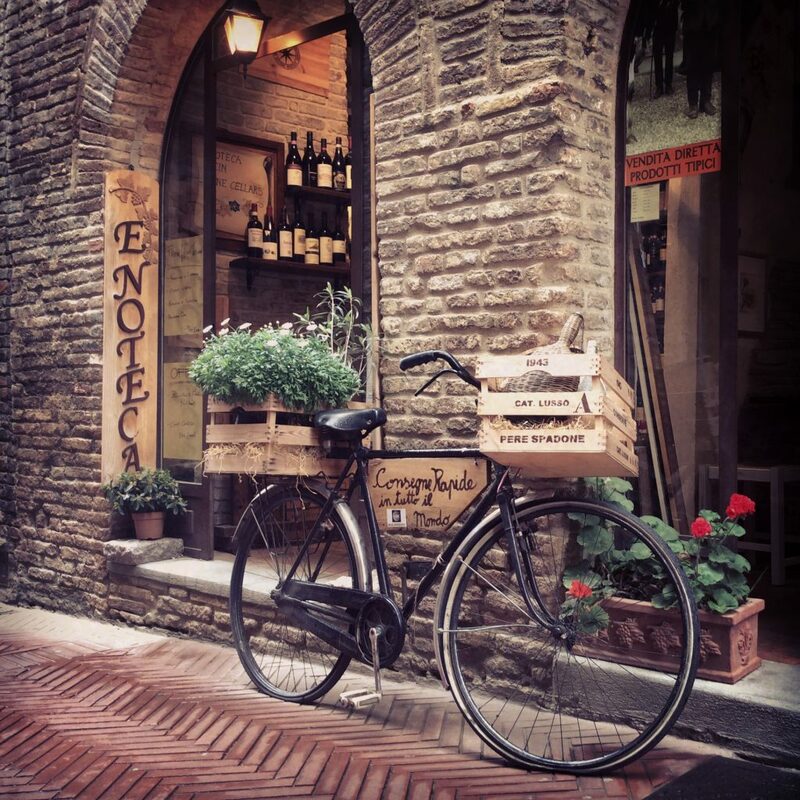 Rain had descended over Toscana, but it only seemed to add to the elegant old atmosphere found in San Gimignano this day. The haunting melody of a guitar playing gypsy man floated on the mist as we moved under low gray skies towards the Duomo. Arriving under the portico, we were given a brief audience with the mayor of San Gimignano, Giacomo Bassi. His heartfelt message was of the glories of this town and his hopes that our visit would help spread the word of the history, beauty, art, food, and culture to be found here. Not a difficult mission to accept. Built in the late 11th century, the Duomo was consecrated in 1148 by Pope Eugenio III on his way to Rome on the Via Francigena. 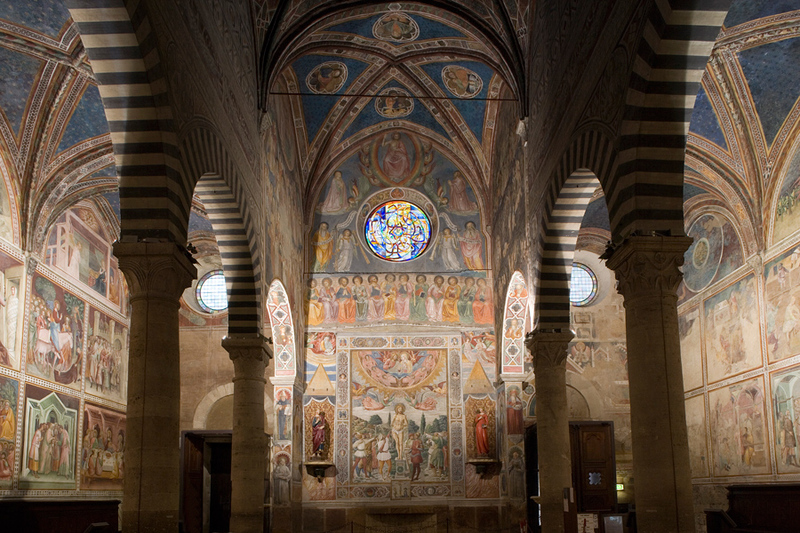 Known as The Collegiate Church, the interior of this imposing presence is a virtual 360˚ panorama of muraled walls. Many collective forces over the ages have combined to bring in commissioned works by many famous artists, and it’s certainly a treat for the eye to follow the murals from Creation to the Annunciation. There are also some notable side chapels, one in particular dedicated to San Gimignano’s St. Fina, a young girl who fell ill and spent the remaining 16 years of her life laid out on a board. She is said to have conducted miracles from here, and upon her death a garden of yellow violas sprung from the board. To this day, these yellow flowers are known only in this area. Vernaccia. Did you hear the “Ahhhhhs”? 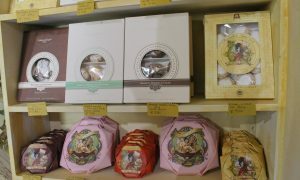 Yes, this is one of the gifts to mankind that San Gimignano takes credit for. A beautiful amber wine that ranges from a crisp young version to a seasoned spicy one, it was the first Italian wine to receive the coveted “Denomination of Controlled Origin” or D.O.C. label in 1966. 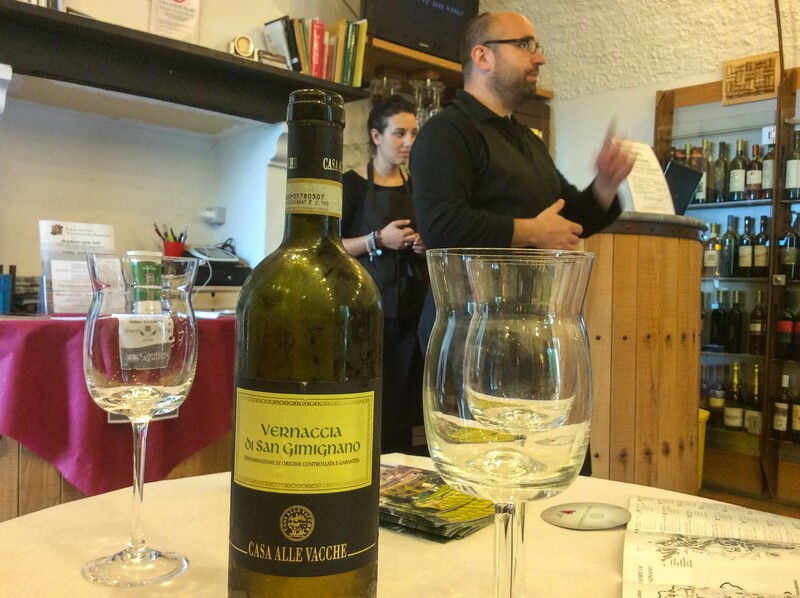 Vernaccia has roots, literally, that go all the way back to the Ligurian area in the 11th and 12th centuries. It was considered a premium wine, quite precious, and as it made its mark in Tuscany it became known as the drink of the rich and famous. This wine, along with the other golden commodity of saffron, added greatly to San Gimignano’s wealth and status throughout the Middle Ages. 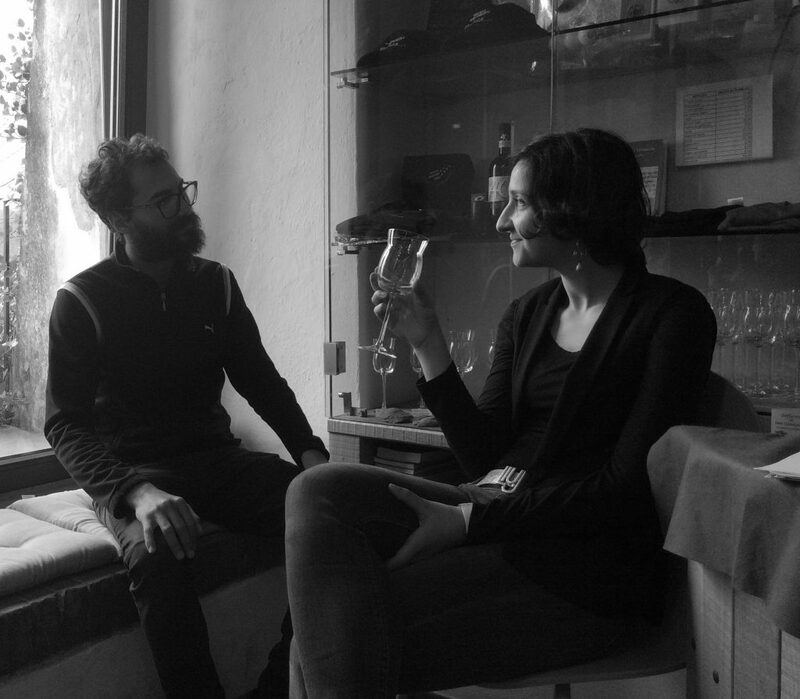 It wasn’t until the 18th century that Vernaccia saw its star fade. Outranked by new-fangled drinks like coffee, tea, and chocolate, Vernaccia fell away to an almost forgotten common wine. Like love beads and long hair, the 1960’s brought a new look at Vernaccia as the old vines were rediscovered and restored, and this ancient wine was brought back to prominence. We enjoyed a great tasting experience and interesting information at the hands of sommelier Andrea in the town’s Vernaccia Museum. My kind of museum experience! 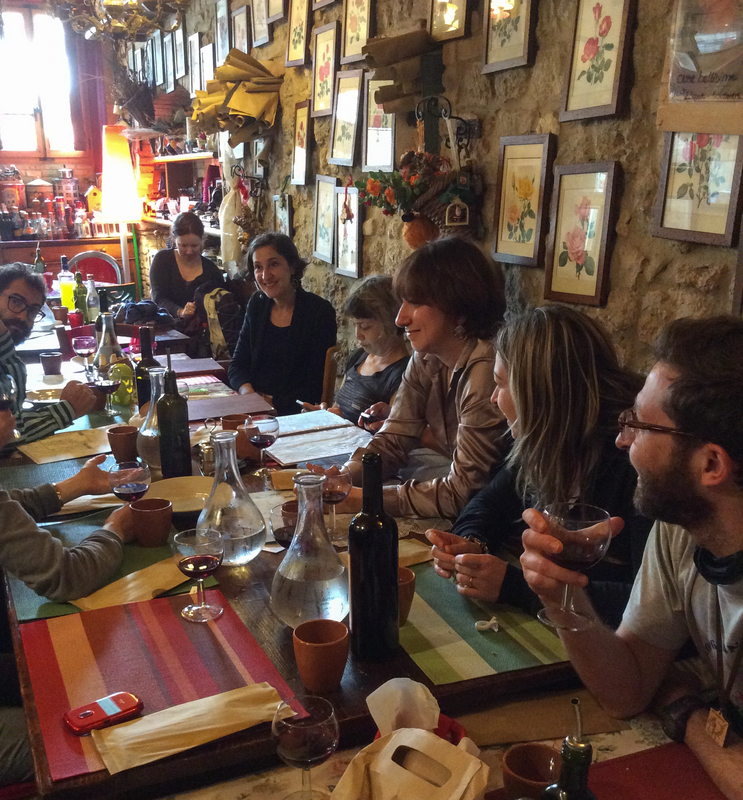 Time for pranzo, and we were lead to a rustic little space called Locanda di Sant’Agosstina that sits on a piazza dating to the 1200’s. Tight, but certainly warm, cozy, and dripping in pictures of roses, the restaurant is immediately welcoming and fun. And the food….oh, the food. We were given full choice of the menu, so a large variety was chosen (and devoured). Every morsel was incredible. 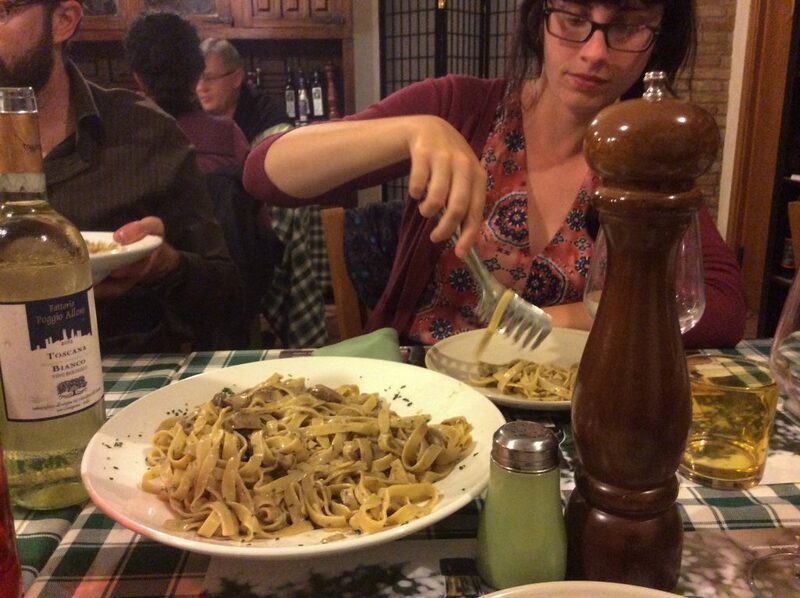 Good thing…we were needing to be fully nourished for the upcoming bike adventure!